After years of losing officers within the ranks because of low pay and pension benefits, the San Jose Police Department says it has turned the corner and is rebuilding its force. Department officials point to large academy classes and the potential return of officers who previously walked away in frustration. 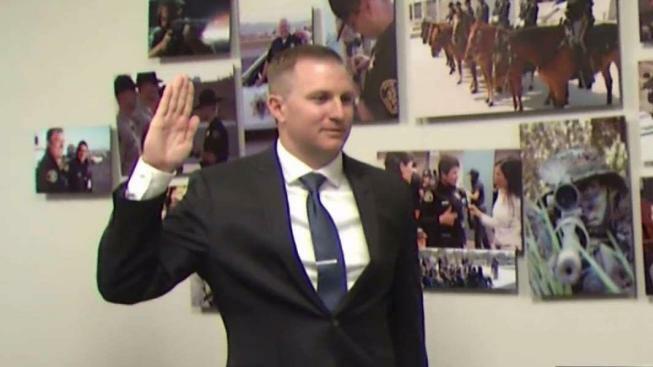 Officer Kyle Burchfiel, who came from the Palo Alto Police Department, was sworn in Monday by San Jose police Chief Eddie Garcia. Burchfiel is one of several police veterans who are now saying they want to be a part of the San Jose force. Surrounded by family and friends, Burchfiel made the jump official. "Congratulations. You are a San Jose police officer," Garcia said after the swearing in ceremony at police headquarters. The event marked a turning point for the department. For years, Garcia spent much of his time reading resignation letters, one after the other, as dozens of officers retired early or left the force because of pay and pension cuts. Now, he said, they’re starting to come back. "We’re not a desperate department any more," Garcia said. The two current SJPD academy classes are the largest in years, with 20 cadets in the first class, due to graduate in two weeks, and 54 in the second class. Plus, this year, 17 police officers applied to return or transfer to San Jose, compared to just one the past two years, Garcia said. The chief credits those who stayed on the force when the future looked bleak. "The officers who sacrificed and stayed here did not allow the department to crumble," he said. "I owe them. This community owes them everything." Burchfiel said, in his eyes, the San Jose badge never lost its shine, even during tough times. "It's still a great department, and I can’t wait to start working here," said Burchfiel, who hits the streets for his first shift Sunday morning. San Jose officers received a 10 percent pay raise on July 1 and a bonus on Jan. 1. But Garcia said there's still a lot of work to do to get the department where it needs to be.